Paramount 14012 was recorded May 11, 1927 in New York City and was originally issued on Paramount 12486. This issue is a 1948 dub made by record collector and producer John Steiner. The band features the talent of Joe and Russell Smith on trumpet, Benny Morton on trombone, Buster Bailey and Don Redman on clarinet and alto sax, Coleman Hawkins on tenor sax and clarinet, Fletcher Henderson on piano, Charlie Dixon on banjo, June Cole on tuba, and Kaiser Marshall on drums. The label erroneously credits Tommy Ladnier, who does not play on this record. “Swamp Blues” tops my list of all-time favorite jazz recordings, and was the reason for my purchasing the record. 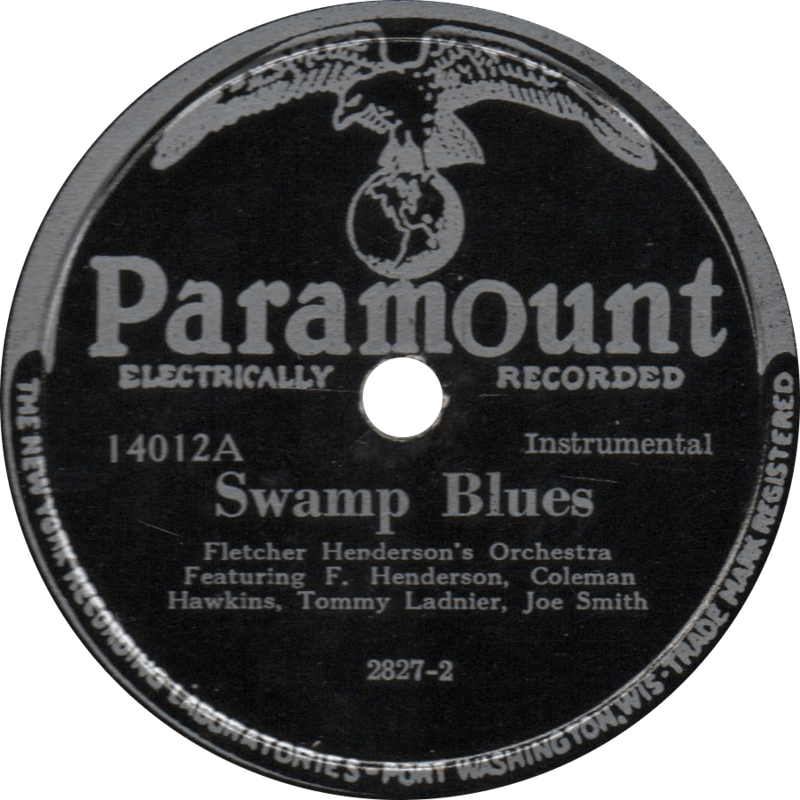 Swamp Blues, recorded May 11, 1927 by Fletcher Henderson’s Orchestra. Perhaps even hotter than the previous, “Off to Buffalo” is another superb jazz side, not to be confused with the similarly titled Warren and Dubin song “Shuffle Off to Buffalo” from Forty-Second Street. 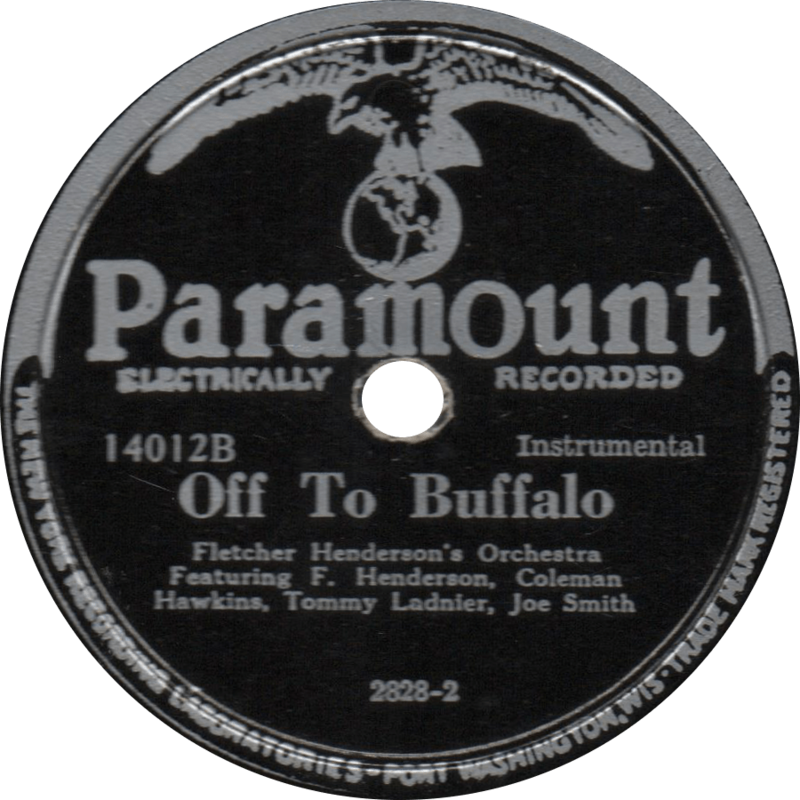 Off To Buffalo, recorded May 11, 1927 by Fletcher Henderson’s Orchestra. Updated with Improved audio on June 19, 2017. This entry was posted in Records and tagged 1920s, Benny Morton, Buster Bailey, Charlie Dixon, Coleman Hawkins, Don Redman, Fletcher Henderson, Harlem, Jazz, Joe Smith, June Cole, Kaiser Marshall, New York, NYRL, Paramount, Race Record, Reissue, Russell Smith by R. Connor Montgomery. Bookmark the permalink.